There are, however, exceptions to this and Sarah Wilson’s I Quit Sugar Cookbook is one of them. Why? It’s not a fancy recipe book – there are “no croquembouches”, but the food looks and tastes great. Most of the 108 recipes are fructose-free, many are gluten- and grain-free. To be honest there aren’t many recipes in the IQS Cookbook that I would fault. 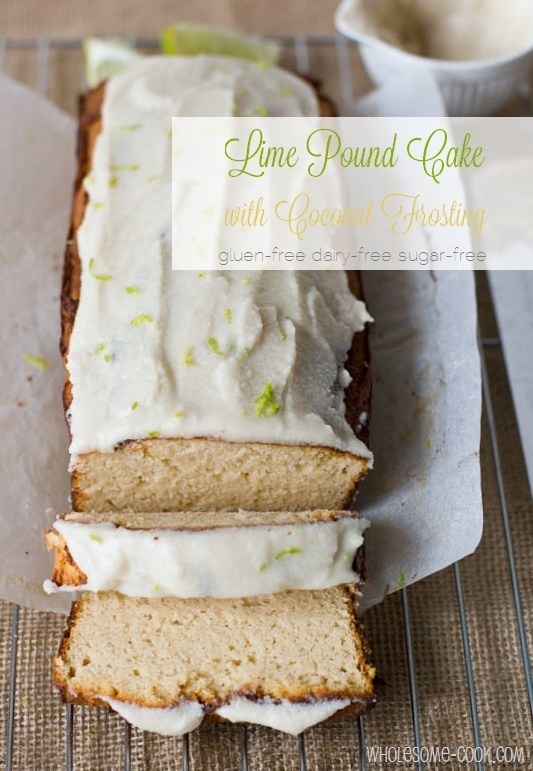 Take this Coconut and Lime Pound Cake for example. I tried to come up with my own adaptation and a few little twists but the original was good in its own right, thanks to The Spunky Coconut who provided this recipe for the publication. More cookbook news: Speaking of sharing and providing recipes for cookbooks, Sarah has kindly agreed to share one of her own sugar-free recipes in my very own Guilt Free Desserts cookbook, which is now available here – you can sign up here to receive a special launch offer plus my regular recipe and giveaway posts. And the cake? Well, it was gone in half a sday – everyone wanted a slice. And then an extra one. It was moist, and delicious, and really guilt-free. I was a little surprised to learn a few people had overlooked or completely missed this recipe based on the comments on Sarah’s repost of my pic of the cake on Insta! Perhaps that’s why I thought I’d share my slight adaptation with full credits with you. 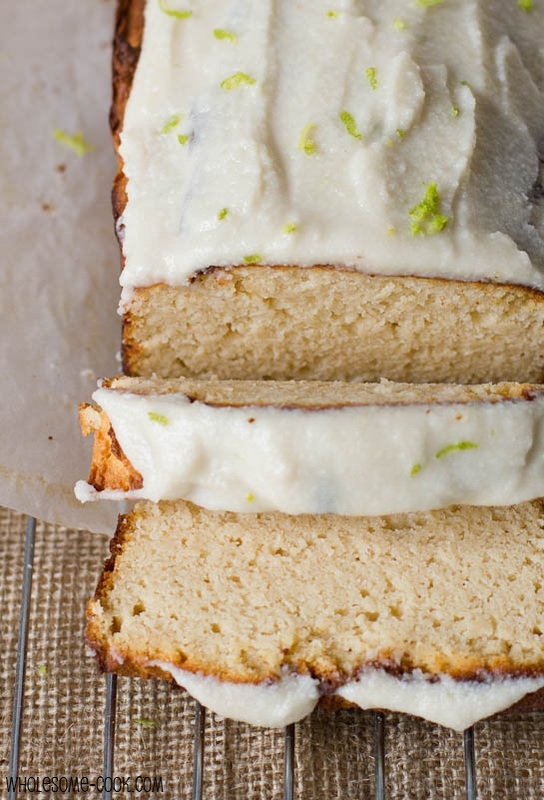 This Coconut and Lime Pound Cake is zingy, moist and a breeze to make. Better still, it is gluten-free, dairy-free, sugar-free. Adapted slightly from Sarah Wilson's I Quit Sugar Cookbook from an original recipe by The Spunky Coconut. Place all Step 1 ingredients into a blender or 2 cup capacity jug and process until silky smooth, about 2 minutes (I used a jug and my immersion blender for this). Transfer the mixture from Step 1 into a large bowl (or your mixer bowl). Add all Step 2 ingredients and mix on medium-low speed until just combined, or for about 1 minute. Transfer batter into your baking tin and smooth over the top. Bake in a preheated oven for about 30 minutes or until the cake is just starting to turn golden on top, and is cooked through - check with a clean bamboo skewer. Remove from oven and cool for 10 minutes in the tin, before transferring to a wire rack. Place all Frosting ingredients in a blender and blend until the mixture is smooth (again, I used a jug and my immersion blender). Set aside until the cake has cooked completely. Spread frosting on top of the cake. Sprinkle over with extra lime zest. Cut and serve. Keep leftover cake in an airtight container in the fridge. You put the lime in the coconut… Couldn’t resist singing that. I don’t think I could resist eating this either. Sounds perfect and this frosting is a brilliant inspiration! 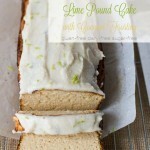 Pretty little pound cake! Lime and coconut are two of my favorite flavor combinations! This looks SO GOOD! I’m definitely going to try making it, the pictures are making my mouth water. Coconut and lime sounds like wonderful combination. And your cake looks really good! it looks awesome, but isn’t rice malt syrup a form of sugar. Whilst it’s not cane sugar, it’s certainly a close relative. Sorry to be Debbie Downer, but I don’t believe it’s possible to have a sugar free cake! Hi Liz NN, the thing about rice malt syrup – and I will be explaining more about this in my ebook, is that the sugars in it act more like glucose (the good sugars) and unlike the high fructose table sugars, agave, HFCS, etc. It is made out of more complex carbs, providing sustained energy. Rice is also a grain, so you can’t really call this cake grain-free. I’m pretty sure Paleo people don’t eat rice or rice products either. Hi Susan, thanks for your comment – I completely missed that. Spunky Coconut does a lot of Paleo recipes, my bad and I’ve updated the recipe now to exclude the grain-free reference. Could this be made without the cashews as I am nut-free? Good question, I thought about that one myself. I am pretty sure you could play with adding extra coconut flour / tapioca / coconut oil… the consistency of the Step 1 mixture was similar to pouring cream (or thin icing glaze). oooh the flavours here just seem totally dreamy! Coconut and lime is a match made in heaven so whether it be healthy, or not, I’d get in and have a slice (or three) of this beautiful cake. During all the other months except summer, we have buckets of limes, literally buckets of them! I can never find enough ways to use them up! Thanks for sharing! Hi Martyna. I made this and it is fabulous! My sister is diabetic so I’m always looking for recipes that are lighter on the sugar and are equally keen on reducing added sugars to my kiddies diets. Also love the fact that coconut flour is choc full of fibre. I also made a version with frozen raspberries, just needed a little longer in the oven but also yum. Is the malt syrup gluten free? Not familiar with the product but I know that usually malt contains gluten. Would love to know, the recipe sounds delicious. Hi Jeannie – yes, rice malt syrup is gluten free as it is made from 100% rice that’s been cooked down to a syrup (also known as brown rice syrup). This pound cake is great. Everybody enjoyed it. I have a question though. Why does the frosting look white in the picture but my coconut flour is darker ? Also is there anyway to have a nutrional value to the recipe? Hi Christine, my coconut flour was a creamy colour which turned out lighter in the photos. I will email you the nutritional value of the cake later today. What would be a good substitute for the eggs in this recipe as there are a lot? I normally use bananas or flax seed but normally they don’t work well over 4 eggs. Any ideas? Hi Rachel, I would say you could try using banana instead of 2 eggs and substituting the other 2 eggs with egg replacer. I made this today and it’s SO moist. It’s the first time I’ve used coconut oil and/or rice syrup. Is this recipe supposed to be super moist, and not as, err, fluffy as a normal cakey bread? 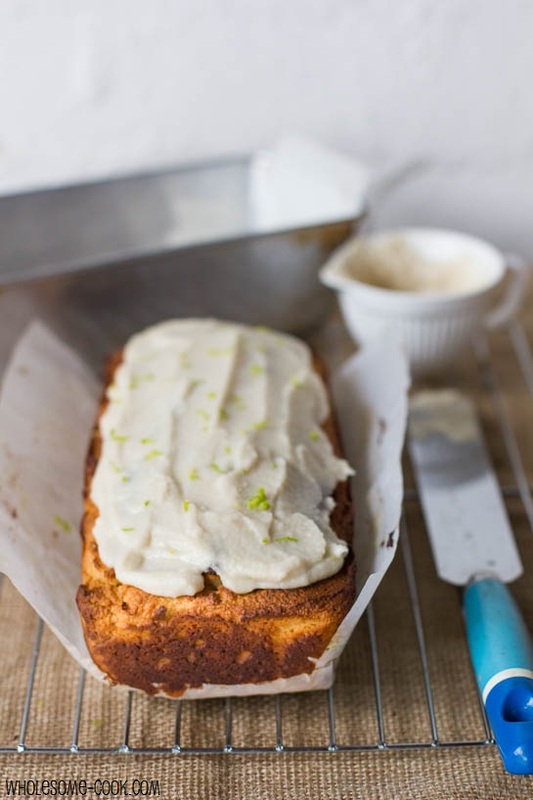 I am planning on making this cake for my niece, who has recently had to go sugar free but I could not find liquid stevia where I am, only natvia. Do you have any suggestions for measurements to replace the liquid stevia? It is made from stevia, but isn’t as pure as I assume liquid stevia is, it says one teaspoon of natvia equals one teaspoon of sugar. Any advice you could offer would be great. Hi Jodie, how lovely of you to bake this for your niece! I use Natvia too and love it as it has very little aftertaste that some of the other brands can leave… I’d recomment using 1/4 cup and then tasting the batter and perhaps adding another tablespoon to the mix. Let me know if you have any issues…. Sounds like a great recipe! Although I’ll have to make some substitutions to make it Paleo. For anyone interested, all you need to do is replace the rice malt syrup with 1/4 c of maple syrup and replace the liquid stevia with 1/3 c. of maple syrup. The recipe calls for coconut cream – but I don’t know what that is. At first I thought it would be included in the recipe, but I’ve looked three times and don’t see ingredients being combined for coconut cream. Sorry to be so dense – but I REALLY want to make this! Hi Cherylie, the coconut cream is used in step 2 – combined with all other ingredients from that step. You can get coconut cream from most major supermarkets (generally in the Asian food sections). Hope that helps. Is coconut flour vital for texture in the sponge or can another kind of flour, i.e. oat flour, wholewheat pastry flour etc be used? I have coconut flour… But no tapioca flour- can I use something else? Cornstarch? GF flour? Thank you… Looks very yummy!! Hi Kelly, you could try cornstarch. I’ve only had stevia in drinks and didn’t like the taste of it.. Does it taste differently in baked goods? Is there a good substitute for the stevia in this recipe?